Do you look good with a Tommy Gun? Are you both glamorous and dangerous? Does a career in the growth industry of protection and organised crime sound like a fantastic idea? 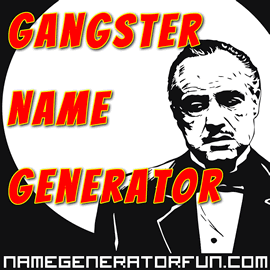 Then it's time to give in to your dark side with our gangster name generator! Is family the most important thing to you? Does following the rules make you want to run a mile? Have you got an offer to make that people simply won't refuse? Then read on! Out of all the gangster syndicates currently active, the most well-known and infamous is the Sicilian Mafia, also known as the Cosa Nostra. Originally formed during mainland Italy's takeover of Sicily during the nineteenth century, the Mafia is a loose collection of criminal groups that share similar aims or codes of conduct, and are usually known as 'families' or 'clans'. Their members refer to themselves as 'men of honour', and Mafia groups normally earn most of their money through protection racketeering. The Mafia has since spread widely through the United States and Canada thanks to emigration during the twentieth century, and is still an intimidating criminal force. Also known as 'The Brotherhood' or the Russian Mafia, the Bratva are a collection of organised crime groups who originated in Russia, but whose network spreads to a variety of countries across the globe. Often referred to as 'OPG's, the Bratva's history stretches all the way back to the Imperial era of the Tsars, but it wasn't until the twentieth century and the Russian revolution that certain criminals emerged as leaders of groups in prison, and coined the name 'vory v zakone' – or, thieves in law. After the end of World War 2 and the death of Joseph Stalin, an explosion of Bratva activity began and they truly cemented their power following the fall of the Soviet Union in the early 1990s, allegedly controlling up to two-thirds of the Russian economy. Their power may have slipped a little since then, but the Bratva remains a quasi-military group with a truly fearsome reputation. Originating from South California, the Crips are a criminal gang that were originally formed in 1969 when small-level gang leaders Stanley Tookie Williams and Raymond Lee Washington agreed to combine their forces. Previously rivals from the east and west side of the South Central area of LA, this agreement led to a rise in success, and the newly formed Crips were soon a force to be reckoned with. Over the years, they've developed from a conglomeration of two gangs into a collective of multiple groups known as 'sets', who often end up in open conflict with each other. While initially the Crips were known for wearing blue clothing, this practice has faded away thanks to police crackdowns. The rise of the Crips was also down to the arrival of crack cocaine in California during the 1980s, and by the end of the decade they were reckoned to be one of the largest street gangs in the USA, as well as in regular conflict with the rival LA-based criminal gang the Bloods. This rivalry has continued to this day, but while the Crips regularly split into smaller groups and fight among themselves, they remain an intimidating factor in Californian crime. A criminal group with a long history and an emphasis on ritual and strict codes of conduct, the Yakuza originated from groups of Japanese peddlers and gamblers in the late 1600s. These groups gradually evolved their own organisational structures and were eventually recognised by the Japanese government of the time, but soon turned to more determinedly criminal activities and proved impossible to stamp out. They consolidated their power in the aftermath of World War 2, and now function as part of Japanese society that is difficult to ignore. The Yakuza are also regarded as semi-legitimate operators, and have not been afraid to use their considerable power for good – for example, offering disaster relief in the wake of the Kobe earthquake in 1995. Anti-gang laws passed by Japan in 1992 resulted in a massive drop in numbers of Yakuza, but they are still a strong presence in Japanese society, with the Yamaguchi-gumi Yakuza clan holding over 55,000 members and carrying out criminal activities all across Asia. 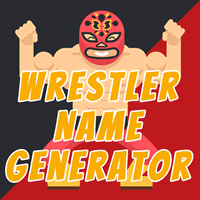 If you enjoyed this generator, you might also enjoy our supervillain names, or you can check out the rest of our site via the menu above! Image Credit: Godfather from FreeVector.com.